This a photograph of the Capital City Rifle Team in Topeka, Kansas. In 1885, the club changed its name to the Topeka Rifle Club. 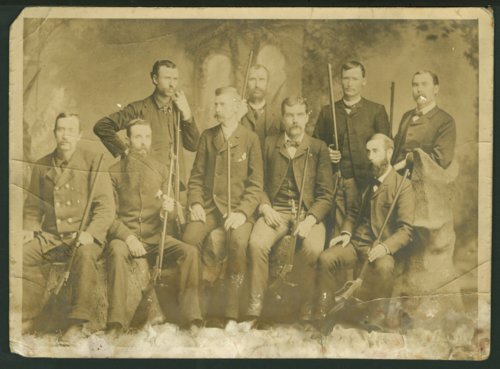 Members are identified as: seated (right to left) Robert Thompson, George Morrison, J. T. Williams, E. W. Sherman, and Reed McCarter, and standing (right to left) John Leonard Paine, C. C. Trimmer, J. H. or L. Leonard, and F. H. Martin.